Many of you work for organizations that produce and dispose of hazardous waste as a part of daily operations, but how confident are you that these toxic, flammable, or corrosive chemicals are being properly handled to avoid a safety incident on your job site? These days we all know about the disastrous consequences of releasing hazardous waste into the environment, so organizations must take all steps necessary to ensure the safety of their employees and the general public. However, all too often we hear stories about fires caused by poor storage of waste or contaminated drinking water resulting from a chemical leakage. Therefore, let’s take a look at the SafetyDNATM blind spot that leads to mishandling hazardous waste, and what we as safety leaders can do to reduce the associated risks. Hazardous waste exposures most often stem from behaviors related to the Follows Rules factor of the S.A.F.E. model of SafetyDNA. Some employees display a greater natural tendency to break rules than others, but all employees must conform to and maintain safety standards, particularly when they are responsible for the well-being of others. Because most safety incidents involving waste materials are preventable, employees who violate these safety rules unnecessarily increase the risk of exposure for themselves, their coworkers, and the public. 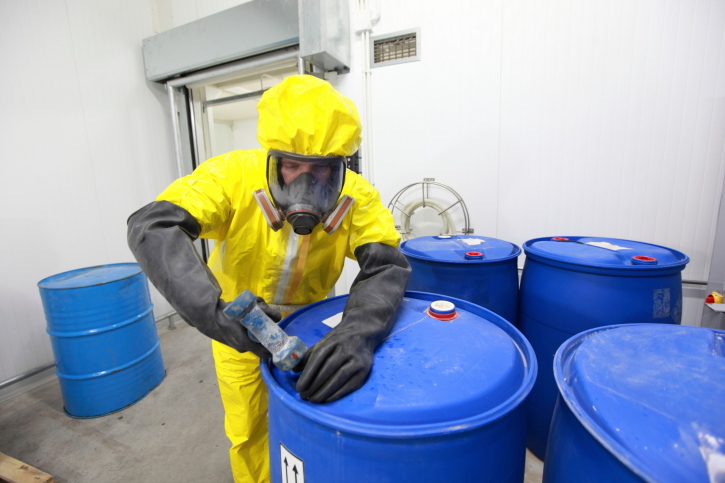 Proper hazardous waste control is not a mere suggestion, it is strictly outlined by Federal, state, and industry regulations. For example, OSHA’s Hazardous Waste Operations and Emergency Response Standard (Title 29 Code of Federal Regulations) establishes guidelines for the safe and effective handling of hazardous waste, which if followed, essentially eliminate the potential for human error in waste management. So the issue here is not about insufficient safety regulations, but rather the commitment to and enforcement of these regulations. You may have already implemented some of these measures to improve employee safety, but even organizations that have not experienced a recent safety incident can benefit from reviewing their current policies to identify areas for improvement and in turn, maintain their safety records. Drawing from Select International’s L.E.A.D. model of safety leadership, updating your waste control program and communicating the changes to employees in a personal manner is one way to Lay Out a Vision of exactly how you plan to keep your employees safe. Once you communicate it to everyone and explain why it’s important, implementing program and enforcing it consistently is the best way to Demonstrate Credibility as a champion for hazardous waste safety. Doing so will influence employees to follow your lead by improving their personal safety behaviors. Above all, we must remember that an incident involving hazardous waste can have a catastrophic impact on the environment and people near the work site, so we have an obligation to follow waste control regulations for the safety of all those around us.